The "great American game" has been described as "so fine, it's played on diamonds." 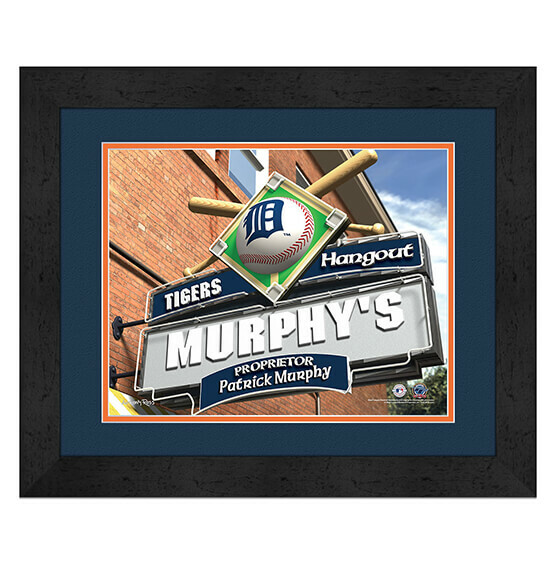 Our Detroit Tigers Personalized MLB Pub Sign features a "sign of a sign" that displays your very own pub with a ball diamond and baseball bat accents. It will brighten up any Tiggs fan zone with its team colors and official team logo. Our custom-made print is on high-quality paper in a mat-like setting behind glass for long-lasting wear and arrives ready to hang for your convenience. Whether you purchase this custom Detroit Tigers sports decor for yourself or give it as a gift, one thing is certain: your good taste and gift-giving reputation is sure to be a hum dinger!